One of the best hostels I’ve ever stayed in. The views are absolutely amazing. The staff is incredible, very engaging and friendly especially Rachel who went out of her way to make sure everyone was enjoying themselves. The food was great and a good value. 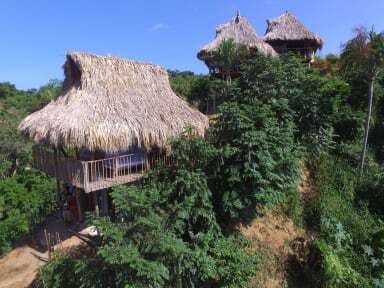 The hostel offers a lot to keep you busy and it is in a perfect location for Parque Tayrona. Such an amazing hostel. You feel like you’re sleeping in a treehouse. Staff was very friendly and helpful. Rooms were very clean and family dinners were tasty and fun. Such a great chilled out hostel. Nice open air cabanas for the dorms however you can hear the road noise. Staff are great! It’s a perfect place to stay before or after Tayrona :) family dinners are also a big plus! Great location if you’re looking to go to Tayrona, it’s just a 15 minute walk to the entrance. Staff were very friendly but the free breakfast is just store bought granola and milk. Would stay here again if I was going back to Tayrona. Great location if your only interest is Tayrona. Super helpful staff. Well! The place is truly amazing! However; the staff is in a complete disarray! everything is run by unpaid employment. Make sense why there is such a lack of training! So everybody, gives you a different answer, Also; what stroke me the most! Everything is on a tab! Including your accommodation! Upon the checkout you will receive 6% additional card charges! Which I later find out that is only 3%! And there is no wifi! 0.8mb speed doesn't even come close a reasonable wifi connection!